For LESS THAN the price of a “$5.00 footlong”! Look what I got for FOUR DOLLARS last week! A matching pair of these vintage end tables for $1.00 each. 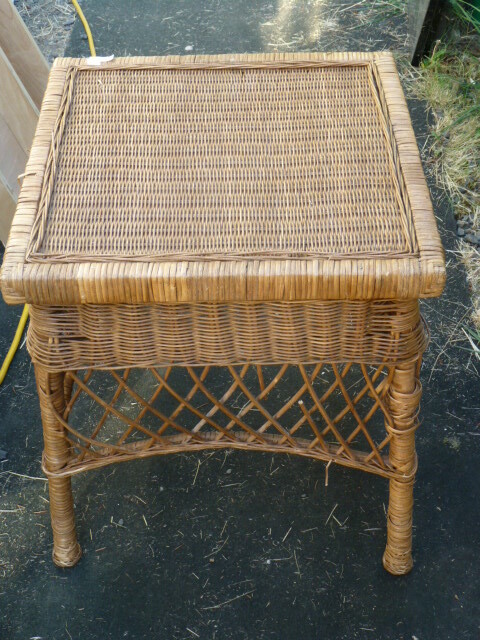 This wicker end table for $1.00. 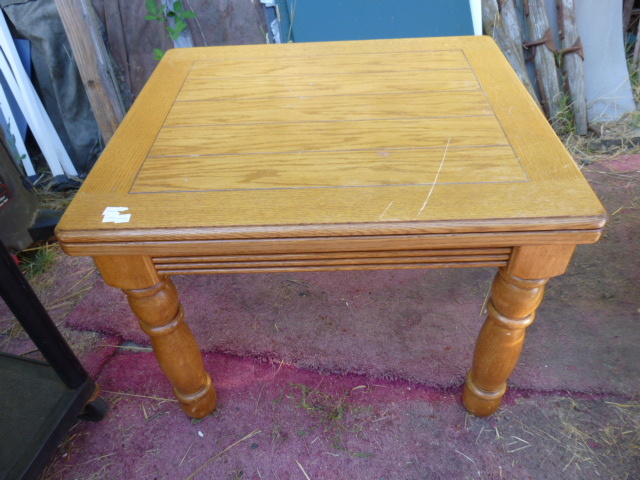 AND this chunky legged wood end table for, YEP $1.00! Guess I was just in the right place at the right time. The Goodwill Outlet Store when they had too much furniture and were marking things that had been sitting for too long down to a dollar! There were quite a few other things that were just one dollar too, but these four filled up my car, so I as done for the day. 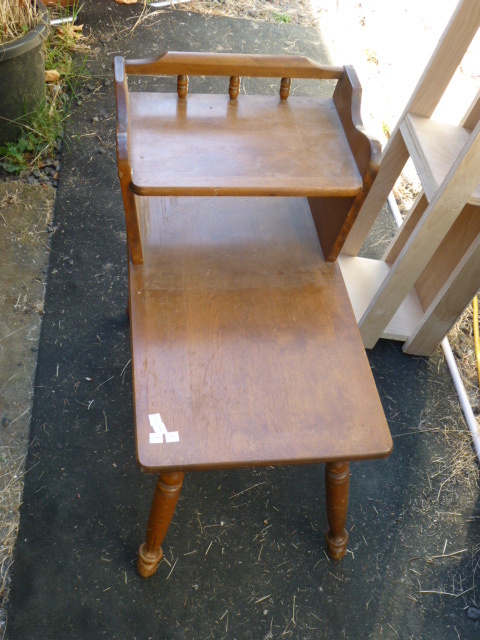 There was also a seven drawer desk, a little banged up, but ‘fixable’, and several tables; including one round 48″ wood pedestal table. I’ll usually go for the SMALLER items, for a couple of reasons. 1) I can CRAM more of them into my booth. and 2) They SELL better! 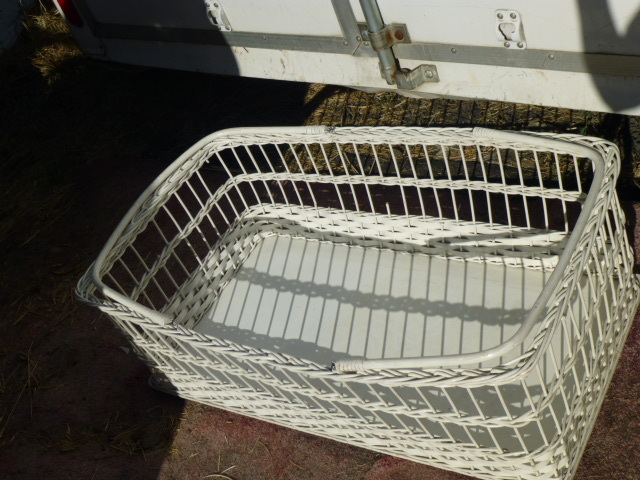 This carry baby bassinet is pretty good shape; a few little pieces are broken. I’m just going to use to display pillows in initially. Then maybe freshen the paint and sell it. I had one almost exactly like this for Elliot when he was first born. Actually found it sitting by the dumpster at my apartment! Painted it brown and used it for magazines initially. A couple of years late when Elliot came along, I cleaned it up, used an old crate as a stand and sewed up a skirt and bumpers. Bought a new mattress and new sheets and voila! Was perfect for his newborn days when I wanted him right next to my bed. 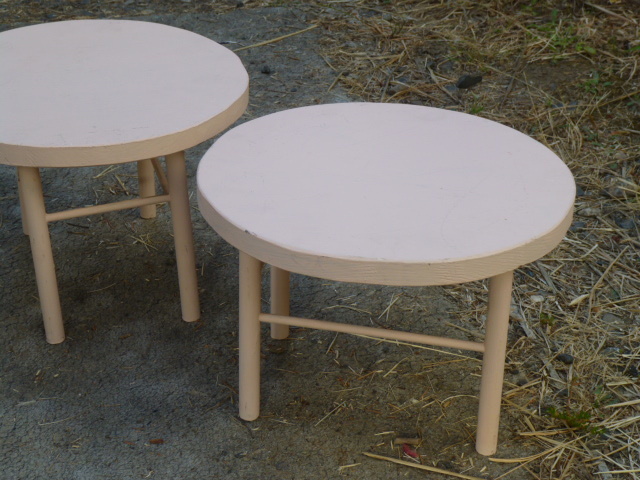 These two little stools are only about 14″ across. Will repaint them and sell them in my booth at Stars. Pictures of refinished items coming soon! What a score! Fun, fun, fun! !